For those adventurous at heart, the Subaru Forester is now, more than ever, the vehicle of choice. All-wheel drive is standard, as is always the case on Subaru’s range, mated to a continuously variable transmission finding power from a 2.5-liter boxer flat-4 with peak power of 182 horsepower and 176 lb-ft of torque. Priced between $24,295 and $34,295, the Forester takes square aim at the Toyota RAV4. Five trims are available, from basic to Touring, with Premium, Sport, and Limited in between. Unlike before, the Sport doesn’t offer more power, but rather includes sportier visuals like 18-inch black alloy wheels, two-tone cloth upholstery, and orange exterior accents. It’s easy to see why, as the Forester is that just-right size, making it practical for most people but still manageable and efficient, with all the brand's typical selling points like standard all-wheel drive, good driving manners, and excellent safety ratings. If you’re looking at the pictures and scratching your head as to whether it’s really an all-new model, you’ll probably have to look at it side by side with the previous generation to see the differences. The profile and body remain essentially the same, with subtle tweaks to the grille, taillights, subtle creases, and the return of plastic cladding. Basic gear includes 17-inch steel wheels, LED headlights, front and rear bumper guards, body-color exterior door handles. As you move up the trims Subaru adds roof rails, alloy wheels in 17- and 18-inch designs, steering-responsive headlights, fog lights, body-color mirrors with integrated turn signals, Panoramic moonroof. Most models have chrome and satin metallic accents, but the Sport trim as reviewed here gets a special appearance package with black trim and grille, with a catchy red stripe along the bumper guard and side sills. While some might say that Subaru wasn’t trying very hard, sales of the Forester skyrocketed when the previous generation launched, so following a conservative, Volkswagen-style evolutionary design is a safe bet. You won’t get people stopping you in the street to tell you how great it looks, but there’s little about it that would turn you away from a purchase when it comes to the design, just as it hits all the right marks for safety and reliability. Over its history, the Forester has had an impressive track record for durability, with an IHS Markit research study finding that 97% of Foresters sold in the last ten years were still on the road in 2017. They’re not the only ones that think highly of Subaru and the Forester as it has quite the awards shelf. 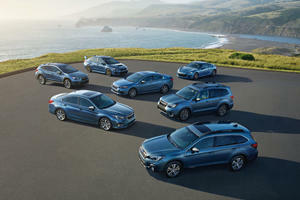 Consumer Reports ranks Subaru fourth in their brand rankings, and the 2018 Forester is tied with the Honda CR-V as the highest-rated compact SUVs, helped along by its five-out-of-five reliability verdict overall, as well as five out of five in every major mechanical system. Although the Subaru brand has plummeted in the JD Power’s Vehicle Dependability Survey, that is largely attributable to significant issues with the slow, poorly designed in-car electronics when the previous generation was just introduced. The Forester itself ranks fairly well, especially for mechanical reliability, but with this being an entirely new generation, expect a few teething issues, especially with early first-year models. What shouldn’t be an issue is the Forester maintaining its IIHS Top Safety Pick+ rating and top scores in NHTSA testing. Since every other Subaru is a Top Safety Pick+ when equipped with Eyesight and steerable headlights (which are a feature of the Limited and Touring trims), there’s no reason to think the Forester won’t also earn this rating. But it’s not just the crashworthiness that is worth noting, as Subaru’s accident prevention systems also earn high marks, the IIHS rating the previous-generation Forester “Superior” for front crash prevention when equipped with EyeSight. EyeSight is standard for the Forester and includes forward collision warning and emergency braking, lane departure alert with lane keep assist, and adaptive cruise control for convenience. 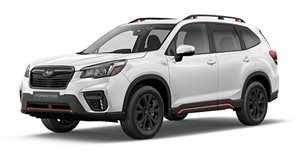 At the other end, Subaru’s rear cross-traffic alert and reverse auto braking also is one of the best (both standard on the Touring trim for Forester, and optional on other trims), one of only two brands to receive a Superior rating for the new rear crash prevention test from IIHS. 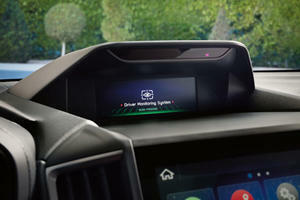 A new feature Subaru has introduced to the Forester safety suite is DriverFocus, which uses facial recognition software to spot signs of fatigue or distraction and zaps drivers with an electrical charge to get their attention. Just kidding, it’s actually just a chime and flashing lights, but a guy can dream, right? Although the platform is entirely new, the engine is an updated version of the 2.5-liter boxer four-cylinder engine, revised with direct injection to yield a little more power and slightly better fuel economy. Peak power of the new engine reaches 182 horsepower at 5,800 rpm, up from 170 hp, while torque only sees a gain of 2 lb-ft, now rated at 176 lb-ft at 4,400 rpm. The sole transmission option is the Lineartronic continuously variable transmission (CVT), with Sport and Touring trims gaining manual shift mode that simulates seven gears, with paddle shifters to take over full control. Being a Subaru, it then sends power to all four corners via its symmetrical all-wheel drive, and the system in the Forester can vary torque between the front and rear axles, and also from side to side to help improve stability when accelerating out of corners. There's also an off-road mode that revises the shifting and all-wheel drive to better handle slippery, unstable surfaces and even features a hill-descent control function. Previously, Forester shoppers could move up to the turbocharged XT that packed a 250-hp 2.0L turbo-four, but Subaru changed tactics with this generation, leaving another small segment of power-power-hungry drivers out in the cold, just as they did with the omission of a hatchback version of the WRX and STI. Instead, the Forester Sport trim provides sporty visual cues, but none of the punch, and it appears Mazda is ready to step into the void with a turbocharged CX-5 that should keep drivers that want a turn of speed in their crossovers happy. The vast majority will be happy enough with the standard adaptive cruise making the commute less stressful and the impressive efficiency that the Forester delivers. The EPA rates the Forester at 26 mpg for city driving, 33 on the highway, and 29 combined. Although Subaru skips the turbocharged XT, the new Forester is a pleasing blend of comfort and competence on the road. The power is entirely reasonable for its size and weight (ranging from 3,449 to 3,588 pounds), and Subaru has cleverly tuned the throttle for fairly quick response off the line, even in its fuel-saving intelligent mode, so it feels faster than it really is because of those quick starts. At higher speeds, it has to use every bit of the CVT’s cleverness and ability to simulate seven gears to get any acceleration if you’re already at highway speeds. The sport mode helps in this regard, making throttle response at any point much quicker, but in everyday driving that sport mode is too sharp, especially in crowded traffic. One area where the Forester is really improved is noise reduction, and even if the engine moans and the CVT drones a bit when you’re accelerating hard, at steady cruising it is a whisper-quiet cabin. Driven mildly, the Forester is incredibly smooth thanks to the CVT and linear power delivery, and it is complemented by a suspension that offers excellent comfort on rough roads or off pavement completely. The adaptive cruise and steering assistance systems are well sorted, too, maintaining a gap without overreacting too abruptly, and working proactively to keep you centered in your lane, not just yanking you back if you cross the lane markings. Despite the comfort levels, it is reasonably stable in corners and the steering is wisely balanced to offer suitably quick response, but without being too heavy. The light steering, great visibility, smooth throttle, and standard backup camera also make it one of the easiest cars to park for its size. Not only is the Forester easy to park, it’s also easy to get into and out of, especially in the back, where the doors open incredibly wide for generous access, which is a huge boon to parents that have to install child seats and then buckle up kids into their toddler years. The Forester was already a leader in overall passenger space, and it has only gotten better for the 2019 model as its wheelbase and length grow. Rear legroom is up over an inch to 39.4 inches, with a reasonably small driveline hump in the middle. Headroom in front is better than the class-leading CR-V (but not in back), and shoulder room is better than the CR-V in both rows, so it is one of the better options if you need to seat three across in the back seat. Cargo volume has also grown for this generation, now listed at 33 cubic feet in the trunk with the seats in place, which was more than enough for a small Ikea run. With the rear seats folded down, that space grows to over 70 cu-ft, 43.3 inches wide at its narrowest point and 73 inches long to the front seatbacks. If you don’t need all that cargo space, the rear seats split 60/40 so you can fold just part of it and still fit one or two passengers in the back. For added convenience, there are grocery hooks and a bit of extra concealed storage under the floor panel. In our Sport trim, the seat fabric was an interesting cloth, finished with orange stitching, as was the leather steering wheel, but more importantly, the fabric was breathable and complemented the comfort and support the seats offered. The fabric and orange stitching is repeated elsewhere in the cabin, and with some orange accents around the shifter and vents, huge panoramic sunroof, and a big 8-inch high-res touchscreen, it’s a colorful, vibrant interior without being too flashy. The big touchscreen makes it easier to see and control infotainment functions, with conventional knob and button controls for the auto climate control. Although there is still an occasional lag in the infotainment system’s responses, it’s quick enough, with big, clear icons and logical menus and, on the whole, it was easy to use. Above the central touchscreen is a secondary information screen with various info about the car including fuel consumption, safety systems status, and all-wheel-drive torque distribution. Standard equipment for the $24,295 base-model 2019 Forester (plus $975 Destination charges for all models) includes a 6-way manually adjustable seat, plus tilt and telescoping steering wheel, dual USB charging ports, and the Starlink infotainment system is 6.5 inches, with standard Apple CarPlay and Android Auto, as well as a variety of other audio integration. The next step up in the Forester hierarchy is the Premium, starting at $26,695, adding a panoramic sunroof, 10-way power driver’s seat, leather-wrapped steering wheel and shifter, 4G LTE Wi-Fi capability, and six speakers for the audio instead of four. The Forester Limited breaks the $30K barrier at $30,795, and it gets leather seats, dual-zone auto climate, blind-spot detection, rear cross-traffic alert, heated front seats, and the 8.0-inch touchscreen is standard with optional navigation. The top trim is the $34,295 Touring, with all the safety systems and navigation thrown in, plus the front passenger seat is power adjustable, the driver’s seat has two memory positions, and both rows get heated seats, with saddle brown available as an interior leather color in addition to black. The 2019 Forester comes up short on features compared to some competitors that offer cooled seats, 360-degree cameras, better infotainment systems, engine upgrades, and higher quality, but it is still an excellent option in the middle tiers in terms of value, features, comfort, practicality, performance and fuel efficiency. That’s a lot of things that it does right, so it’s a vehicle that needs to be on your shopping list alongside the sales-leading Honda CR-V and Nissan Rogue.